This flush interior door is finished with a maple veneer. These types of doors can be oversized and are typically seen as interior doors of buildings and the entry doors to offices. They are not necessarily heavy, depending on the core material that is used inside the door to reduce the hollowness of the door. 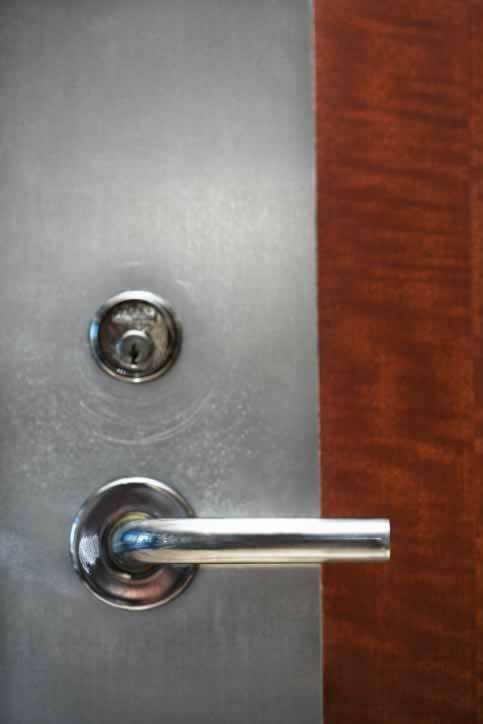 This door has both a stainless steel door lever and a stainless dead bolt, which provides extra security, because the lock cylinder must be rotated for the bolt to move. The stainless steel finger plate--also known as a push plate or door plate--runs the entire vertical length of the door's stile. The purpose of this plate is to protect the door's finish from dirty hands and to provide a surface that is easier to clean. In a public place, such as a high-traffic office environment, finger plates may be a smart addition to a door.